US Real Estate Trust. Typically Canadians who own US real estate are best served by a “US real estate trust.” Simply put, this is a revocable trust that holds only US real property owned by a Canadian national. If the owners are a married couple, which is usually the case, upon the death of one of the spouses, the property usually goes to the survivor, and after the survivor dies, to their children, or anybody else named as beneficiaries – all without a probate proceeding. This can save thousands to tens of thousands of dollars depending on the value of the property (probate attorneys are paid a percentage of the value of the probated property). The US doesn’t treat a revocable trust as a tax entity, so there are no US tax consequences to this type of trust. In contrast, however, foreign tax systems often treat revocable trusts as taxable entities. In fact, Canada does just that. 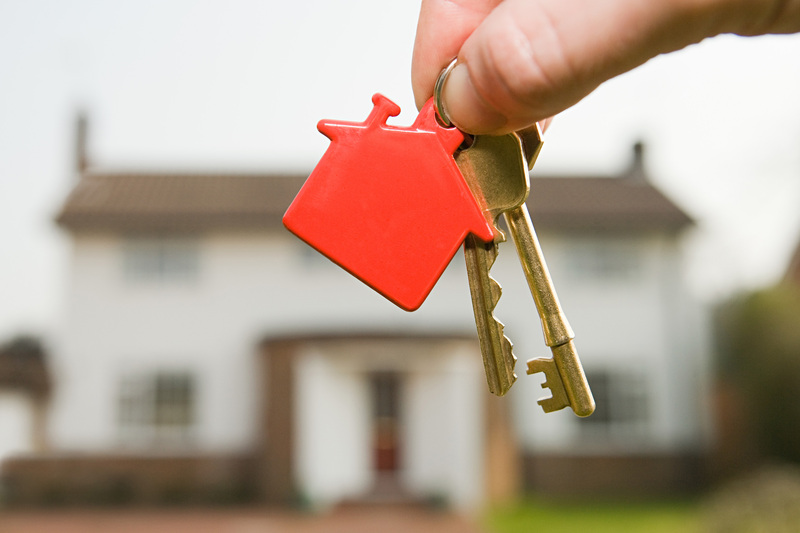 Transferring appreciated real property into a trust can result in Canada assessing a tax. So some analysis has to go into determining whether a US real estate trust makes sense in a particular case. The US real estate trust solves the probate problem. Regrettably, for foreign nationals whose home country lack a favorable tax treaty with the US, it does not solve the estate tax problem. Without a favorable estate tax treaty, foreign nationals are limited to an estate tax exemption of only $60,000. Transferring the property to a revocable trust doesn’t alter that limitation. Instead, more extensive estate planning involving a special irrevocable trusts or entities are required. In contrast, many European countries have tax treaties with the US that provide some estate tax relief. The US-Canada Tax Treaty is the most favorable of all, providing Canadians with a $11.2 million exemption (or $22.4 million for married couples), prorated based on the proportion of the Canadian citizen’s US assets in relation to his total estate. Generally, for Canadians under this threshold, the US estate tax can be handled as simply as having your home country executor filing a US tax form for “invoking the tax treaty,” though it may require filing a nonresident US estate tax return, depending on the value of the US property, the residency status of the owner, and the beneficiaries of the trust. The owner’s residency status will also determine the credit amount available to reduce any estate tax. The US-Canadian Tax Treaty provides other relief, such as a crediting any US estate tax owed against the “deemed disposition” tax Canada will impose on the US assets, and a special marital credit, which essentially eliminates most estate taxes except for extremely large estates. Finally, in this estate plan, the surviving spouse gets the basis in the property “stepped up” to date-of-death value (if the trust is drafted properly) . This may be important if the surviving spouse ultimately sells the property, since it should reduce the taxable gain. This benefit contrasts with joint tenancy, discussed below. The Cross-Border Trust. If your net worth is over $11.2 million as an individual, $22.4 million as married couple, you may want a more complex “cross-border” trust to avoid US estate taxes. 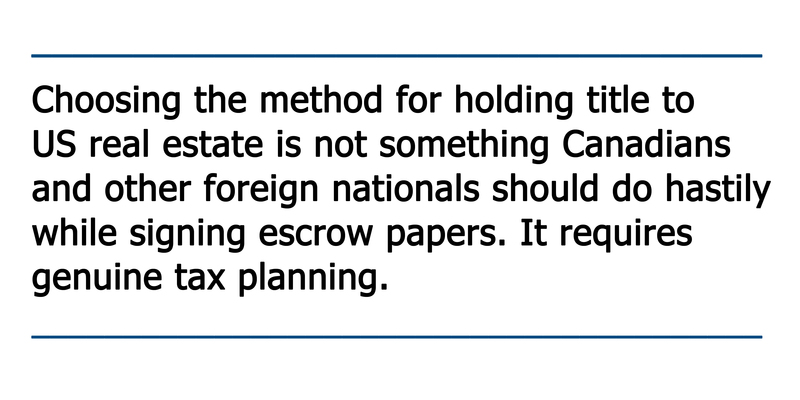 This is a consideration for Canadians who want to avoid the high rate of US estate taxes. Setting up a cross-border trust is complex, expensive, results in some loss of control of the asset, and requires significant input from home country tax counsel. It is rarely necessary for married Canadians due to the favorable estate tax treatment they receive under the US-Canada Tax Treaty, in particular the marital credit. Joint Tenancy. If you plan to sell the real property in the not-too-distant future, and you’re relatively young, then you might be best served by holding the property in joint tenancy. Joint tenancy avoids probate upon the death of the first spouse to die. To transfer the property to the surviving joint tenant requires only the recording of some relatively simple paperwork. Many brokers advise joint tenancy for Canadians as the default method for taking title. But there are downsides. A probate will be necessary when the surviving spouse dies unless they put the property in a trust or otherwise dispose of it. More important, you potentially lose some income tax benefits upon sale. Namely, when the first spouse dies only half the basis is stepped up to date-of-death value. That means, if the surviving spouse sells the property, there will potentially be a higher capital gains tax on the sale. Note this is not the case if the property is held in community property with right of survivorship, where the surviving spouse avoids probate and gets a full stepped-up basis. But this method of title comes with all the burdens of community ownership. Finally, joint tenancy offers no estate tax protection. Revocable Transfer on Death Deed. California recently established a simplified system for transferring real property called a revocable transfer on death deed. Basically, it allows the owner of real property to name beneficiaries in the deed itself, who will take ownership of the property upon his death, without the need of a probate. It is similar to a death beneficiary designation in an IRA or other financial account. The advantage is that it’s inexpensive and can be revoked at any time by the owner. The downsides are it’s public, if the beneficiary dies before the owner a probate may be required, and changing the beneficiary requires recording a new deed (rather than the simple trust method of preparing and signing an amendment). Perhaps the biggest drawback is that the transfer on death deed is totally new, so there is uncertainty about what legal disputes it will raise, especially if the property is currently held by more than one owner. Entity Option. Finally, for Canadians who plan to rent their US property for annual amounts expected to be significant, they may want to consider a business entity to hold the property. Entity ownership provides various benefits, from liability protection to probate avoidance. Unfortunately there can be limitations on the type of entities foreign nationals can use due to a mismatch in some of the provisions of the tax treaties. That’s the case with Canada, which doesn’t recognize limited liability companies, the vehicle that would typically be used in the US to hold rental property. Using a limited liability, therefore, could result in double taxation. In addition, the inheritance of the business interest also often subjects non-nationals to different tax treatment. Accordingly, significant planning has to go into this option. 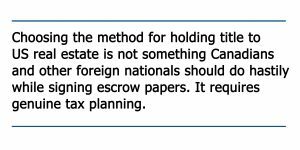 To summarize: choosing the method for holding title to US real estate is not something Canadians and other foreign nationals should do hastily while signing escrow papers. It requires genuine tax planning. Manes Law offers world class expertise in estate planning for international clients who own US assets, with an emphasis on Canadians purchasing vacation homes. Our knowledge of US tax treaties with Canada and other nations, and our experience in international probates, drafting cross-border estate plans, particularly Canadian-US real estate trusts, makes us the industry leader in assisting foreign nationals minimize US estate taxes and income taxes relating to US assets and investments. Learn more at our website: www.calresidencytaxattorney.com.